Here in Sweden we have an Elvis album doing pretty well in the charts right now, and its success reminds me of the ongoing chart performance of An Afternoon In The Garden in the US. 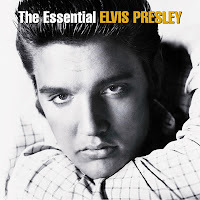 I'm talking about the 2 CD compilation The Essential Elvis Presley, a greatest hits collection. When released in 2007, it topped the album chart in Sweden. At the end of July this year it re-entered the Swedish album chart at #22, and last week rose to #17, the best position the album has been listed on since it left the Top 10 back in September 2007. It is currently certified Gold, reports ElvisMatters. I think one can draw parallels with the success of An Afternoon In The Garden. First of all, both albums are sold at places where a lot of casual byers passes through (I've spotted The Essential Elvis Presley at supermarkets and gas stations). Secondly, none of the titles cost that much, and they offer great value for money. In the case of The Essential Elvis Presley you get a total of 40 songs that are indeed essential, spanning from "That's All Right" to "Moody Blue." In fact, when I passed the train station yesterday, I visited a tiny record store located there, and noticed that The Essential Elvis Presley was on sale there too. Incidentally, the cover isn't the one that ElvisMatters has included in their article, but the one I think is used for the U.S version as well. At least that's the only one I've seen here in Sweden. Elvis Today ... And Every Day!